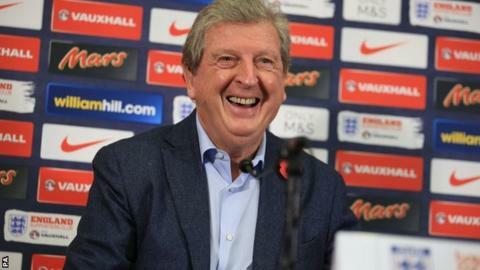 England manager Roy Hodgson says he will only pick players who have proved their fitness for the Euro 2016 squad. "I would rather have 23 players who are all fit and ready to go," Hodgson said. "I wouldn't be happy to really take players with us in the hope that they will become fit during the tournament." The words could be interpreted as a warning to the likes of Daniel Sturridge and Danny Welbeck ahead of the tournament, which begins on 10 June in France. Liverpool striker Sturridge played in all three of England's 2014 World Cup matches, but missed the entirety of England's Euro 2016 qualifying campaign with thigh and knee injuries. Arsenal forward Welbeck has been out since April with a knee injury. However, Hodgson insisted he would give the duo the chance to prove their fitness. "They must be devastated to have lost so much football, but who knows what it's going to bring? We hope they're going to be back," Hodgson said. "[But] are we going to take a player to the tournament who's virtually not played any football, but because he's a talented player might just become, in some miraculous way, capable of playing football? It's unlikely." While Welbeck and Sturridge have struggled to press their claims, Leicester City's Jamie Vardy has shone - and has scored in each of his last nine league matches. Ahead of England's friendlies against Spain and France on 13 and 17 November, Hodgson said earlier this week that Vardy "should be happy to be in the squad, and even happier if he makes the team". But BBC Sport pundit John Hartson said: "If Vardy is fit and raring to go he should start. His form is incredible."